Reading Between The Lines, Will It Change Your Reviews? This past weekend I was frazzled. I have a problem relaxing and doing nothing because there is always something to do. This past weekend I forced myself to look beyond my messy house and all the social media promotion with my books to stay home in my comfy chair and read always having a cup of coffee by my side. What could be better relaxation than that? Recently while chatting with a friend who is an award winning author, we commiserated on the fact we seldom read for fun anymore because we read books by other authors whom we know and support and need to give reviews or blurbs for books. This weekend I chose to read books by authors I don’t know and for pleasure. They so touched my heart I felt I needed to expand on that, especially one book and one author. The first book I read was by Claire Cook called Seven Year Switch. You might recognize her from her book made into a movie called Must Love Dogs. Seven Year Switch focuses on a single mom whose husband left her and her daughter seven years ago and now he is back. I haven’t had that experience in my life but in reading the book I could resonate with her feelings of responsibility and wanting to believe people we love maybe can change. The decisions she made for her life made me ponder the decisions I have or may be making in my life. It was well written and touched my heart. The second book I read was Hearts On A String by Kris Radish. I have mentioned before that one of my favorite books of all time is Annie Freeman’s Fabulous Traveling Funeral. Kris Radish has a knack for putting together strangers and melding their lives over a journey of some sort. In Annie Freeman’s Traveling Funeral the ashes of a friend are scattered in her favorite places on earth. This resonated with me because I like quirky things and I have always pondered the end and wondered what I wanted my family to do after I was gone. I have always said I don’t think normal and I feel as if I am a fish out of water having to conform to the way others live their lives because I haven’t found anyone to share the quirkiness with me. This book hit my quirkiness right smack in the face. I have always felt if I knew this author in person we would be good friends. I downloaded Hearts On A String this weekend and found I couldn’t put it down. I am glad I didn’t read the reviews for this book before I started as I might not have bought it. Isn’t that human nature we look at the bad reviews but not the good and that is also what we hear in our own internal chat with ourselves. But you see, those people that read this book and gave it a bad review didn’t get it. 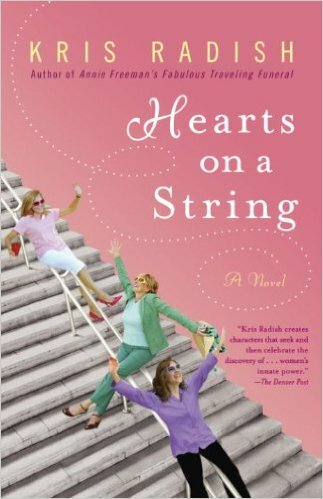 Hearts On A String is about a group of women of all ages meeting my chance in an airport bathroom. Their antics were funny and quirky, which is why I kept reading. It led them through a string of unusual circumstances and through it all they were able to get past their mistrust and share their story with strangers. Haven’t you found it is almost easier to share with strangers because we might never see them again and we don’t have to worry whether they accept us or not? I wanted to meet women like these women. This book hit what I have been feeling in my life. I have felt like the outsider. I have felt like I had to conform. I have felt like I was going through the motions because no one got who I was or perhaps because I was afraid to uncover what I felt wasn’t accepted. I have felt the weight of not letting go of the responsibility. We all look for people who have the same likes and interests in our lives because it feels safe. We don’t seek out those who are complete opposites or might shake something up in our lives. I think that is why I liked this book. It brought together five woman who were totally opposite and would never have given each other a chance. Through the rough patches and the ups and downs of the book and the story, they each learned something about themselves, their lives and each other because they took a chance, even if it was unwillingly. This book has heart. Some of the reviews that were not kind, which I read after I read the book, felt it wasn’t realistic. Obviously some readers just look at plot but don’t take the time to examine the characters. And a book doesn’t need to be realistic to have a lesson. Reviews and reviewers are interesting because when we read the reviews we forget it is a personal opinion of someone who might have very different personalities and likes from us. I find movies that are only three stars are the ones I like the best and even some movies which have tanked are my favorites. I am not a big fan of Oprah’s book club choices or many of the New York Times best selling books, yet I am a fan of many Indie Authors and Authors whose names you probably never heard of. The only difference the never heard of authors haven’t been discovered yet. And is a matter of personal taste. Readers tend to read the books that are shouted about the most when they should be reading the books that receive no press or by small publishing companies that have limited budgets. Book Clubs tend to read the popular shouted about books when they too should be reading the books from authors who haven’t got the backing of the big publishing companies because readers are missing out on some great reads and some great wisdom. My advice, read reviews with thought but make your own choice. Look for an author whose book you haven’t heard of in the genre you love. And…take a chance outside of that genre too. Reach out and expand your love of reading. And….in your life of friends….expand your choices, you may find those that are opposite of you will bring a flavor to your life that you love.